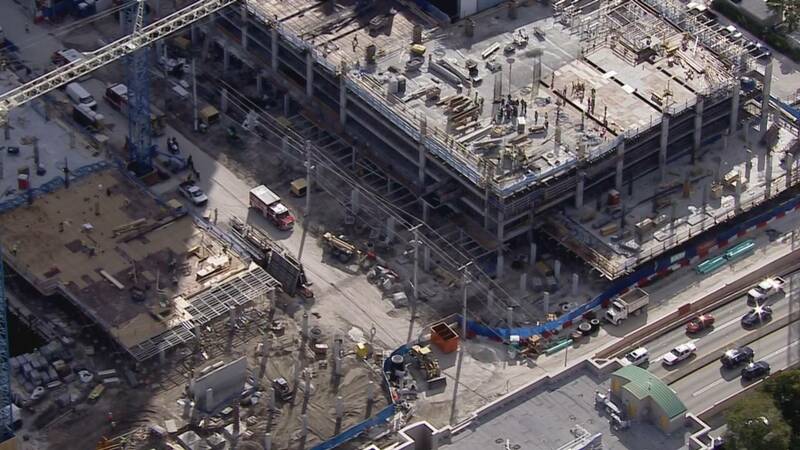 FORT LAUDERDALE, Fla. - A crane was used Thursday morning to bring down a construction worker from the fifth floor of a building after he suffered a back injury, authorities said. Fort Lauderdale Fire Rescue Battalion Chief Stephen Gollan confirmed the incident occurred at a building under construction at 200 S. Federal Highway. "Upon arrival, our crews assessed the situation and found that he had been injured from a piece of equipment that had rolled over and hit him," Gollan said. First responders said the piece of equipment weighed about 1,500 pounds, giving the 35-year-old victim a significant back injury and leaving him stranded on the fifth floor of the unfinished building. The construction is the beginning of a parking deck and high rise, and the ongoing work presented a big obstacle for rescue crews once they arrived at the scene. "The elevators aren't in yet, the ladders aren't in yet and they're utilizing the cranes to get the materials on and off the buildings," Gollan said. "If this would have been a building that was completed, it would have been simply putting the individual in the elevator and bringing him down." Sky 10 was above the scene just after 10 a.m. as the worker was safely lowered to the ground in a Stokes basket. Authorities said it took just over an hour between the initial 911 call and transporting the man to the hospital. The man is listed in stable condition.